Orange County Mayor Teresa Jacobs joined Gov. 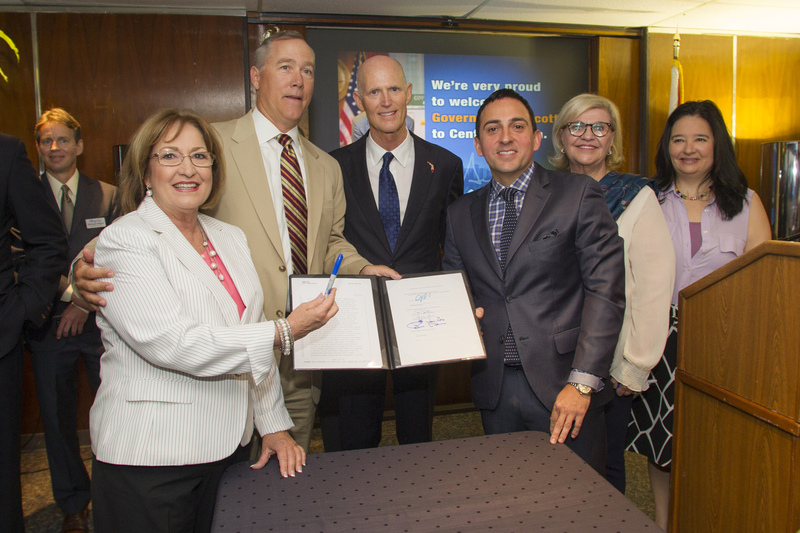 Rick Scott and regional and state leaders for the historic signing of the Housing Assistance Senate Bill 1534 at Orlando, Inc., the Orlando Regional Chamber of Commerce on June 10. Senate Bill 1534 aims to further the housing-first approach and to help expedite efforts in housing chronically homeless families across the state. The bill also allows flexibility in the use of State Housing Initiatives Partnership program funds in order for local governments to provide rental assistance to the homeless. State Sen. David Simmons, Rep. Mike Miller, Rep. Jason T. Brodeur and Rep. Rich Workman as well as City of Orlando Mayor Buddy Dyer and regional leaders on homelessness, including Linda Landman Gonzalez, vice president of philanthropy and multicultural insights with the Orlando Magic and CEO of the Central Florida Commission on Homelessness Andrae Bailey were also present for the event. For many years, Orange County Government has been the single largest funder of public services for the homeless in Central Florida. Through these funds, and by working with other local agencies and organizations throughout the region, Orange County has been able to provide help and hope to those in need. The bill comes at an ideal time as Orange County’s senior leadership works on the Regional Affordable Housing Summit, which will take place on October 20, 2016. The summit will bring together planners, developers, local government leaders and others from across the region to discuss strategies for more affordable housing options in the region. According to numbers released in May by the Homeless Services Network of Central Florida, Central Florida’s annual “Point-in-Time” (PIT) census identified a one-year, 23.6 percent decrease in the number of homeless individuals in Orange, Osceola and Seminole counties, as of Jan. 27, 2016. The PIT count this year identified 1,613 homeless individuals, continuing the downward trend observed in January 2015, when 2,112 unsheltered individuals were accounted for in Central Florida. In 2014, 2,254 homeless individuals were recorded during the PIT during the same timeframe. As work continues to overcome homelessness throughout Central Florida, the symbolic passage of this bill is a significant milestone for Orange County and the State of Florida.